The Columbus Blue Jackets will apparently have another name to consider in net next season. The Swiss Hockey News reports that young goaltender Elvis Merzlikins is expected to make the jump to North America next year. Merzlikins, 24, was Columbus’ third-round pick in 2014 and has been a standout member of the NLA’s HC Lugano ever since. The Latvian keeper took over Lugano’s starting job in 2015-16 at just 20 years old and has performed admirably. So far this year, he has been especially impressive; though 16 appearances, Merzlikins holds a .932 save percentage and a 2.19 goals against average. Fortunately for him, Merzlikins is in the final year of his NLA contract and is reportedly bound for the next level once it expires. 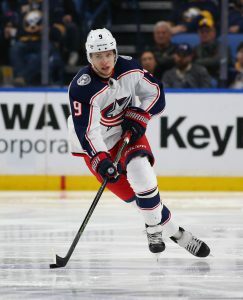 Given his impressive performance, Merzlikins is likely to compete for the starting role with the AHL’s Cleveland Monsters and push for NHL appearances. With only Joonas Korpisalo and untested Matiss Kivlenieks under team control beyond this season, the Blue Jackets face questions in net moving forward and hope Merzlikins could potentially provide some answers. The Swiss Hockey News also relays the news that Dennis Everberg has quickly found a new home. Everberg cleared unconditional waivers and had his contract with the Winnipeg Jets terminated only this morning, but clearly had a new opportunity lined up. Everberg has signed with EV Zug of the NLA, with whom he is surely going to take a much larger role than he had relegated to the minors with Winnipeg. Ironically, Zug was in search of a top forward after another former NHL forward, Viktor Stalberg, departed the team for the KHL’s Avangard Omsk last month. Oskars Bartulis continues to make the most of his post-NHL career. A third-round pick of the Philadelphia Flyers back in 2005, Bartulis played in 66 games with the team but could never quite stand out. After spending much of his time in North America down in the AHL, Bartulis returned to Europe in 2012. Almost immediately, he began establishing himself as one of the top shutdown defenders in the KHL. Even thouhg his play has tailed off somewhat, Bartulis spent the last three years as the captain of Admiral Vladivostok and is still well-respected in the league. When he did not sign a new contract this off-season, there were questions about whether he was done. Yet, he’s back for another season at the age of 31. The KHL reports that Bartulis has signed a one-year, two-way contract with the Kunlun Red Star and should fit in well on a roster that is chock full of talented former NHLers. On the other end of the spectrum, former top NHL prospect Zach Boychuk has been released from his contract with the KHL’s Severstal Cherepovets. Boychuk had been disappointing this year, with just four points in 25 games. In his first season with Severstal, the team was not willing to wait any longer to see if his play improved. The long-time Carolina Hurricane has been overseas for three years now and was very effective just last season with HC Slovan Bratislava. It remains to be seen what the next step is in the career of the capable forward. That’s big news for the Coyotes, who are looking to ride a late-season surge last season all the way to the playoffs in 2018-19. After acquiring several players including Derek Stepan, Niklas Hjalmarsson and Antti Raanta last summer, Chayka was busy again in bringing in Alex Galchenyuk, Michael Grabner and Marcus Kruger to round out the lineup. All eyes though will be on the young core of Chychrun, Clayton Keller and Dylan Strome, who are the key to getting the Coyotes back to long-term respectability. The New York Islanders have shocked no one by hiring Lane Lambert as an assistant coach, reuniting him with Barry Trotz behind the bench. Lambert has worked alongside Trotz for the last seven seasons, prior to which he worked as the head coach of the Milwaukee Admirals implementing the same system Trotz was using while with the Nashville Predators. The two are almost inseparable at this point, and now face the task of returning the Islanders to success in 2018-19. As many have expected, the Columbus Blue Jackets have named former NHL goaltender Manny Legace as their new goaltending coach, promoting him from a similar position with their minor league affiliates. Legace, known as an incredibly consistent backup goalie during his playing career, is now an extremely well-regarded coach that was destined for the NHL ranks. He’ll get to work with two-time Vezina winner Sergei Bobrovsky in his first season in Columbus, but will likely focus more on preparing Joonas Korpisalo for the starting role should the team not be able to reach a contract extension with the former. Bobrovsky is scheduled to become an unrestricted free agent next summer, and could command a deal like Carey Price’s eight-year $84MM extension. After a relatively quiet Monday night in the NHL, the league is back with nine games on tap tonight including a few huge matchups. The Tampa Bay Lightning try to tighten their grip on the Atlantic Division against the red hot Florida Panthers, while the Dallas Stars and Nashville Predators battle in what could be a first-round matchup. As they prepare for these contests later tonight, we’ll keep track of all the minor movement around the league. The Columbus Blue Jackets will be without Sergei Bobrovsky tonight against the Vegas Golden Knights, meaning Jeff Zatkoff is on his way up to the NHL. Bobrovsky is just dealing with a minor illness, which likely means Joonas Korpisalo will be in net when the Blue Jackets try to keep their playoff hopes alive. The Dallas Stars have recalled Roope Hintz and goaltender Mike McKenna from the minor leagues, both under emergency conditions. That may be confusing as Hintz was also recalled yesterday, but after the Stars’ game against the St. Louis Blues he was returned to Texas—at least for a few hours. McKenna is on his way up because Ben Bishop is out with a minor injury, giving Kari Lehtonen the starting role for the time being. The Buffalo Sabres announced that Kyle Criscuolo is out four to six weeks with an upper-body injury, meaning he’s likely headed for injured reserve through the end of the season. The 25-year old forward made his NHL debut this season, and would have been a welcome addition to the Rochester Americans’ playoff run. Though the expectation is to see less “minor” transactions and more fireworks over the next 48 hours, the day-to-day operations of NHL teams don’t stop just because of the trade deadline. With a busy slate of 12 games coming up today, teams continue to tweak their rosters in preparation, though some moves could also signal an impending trade. Follow along to find out. The Columbus Blue Jackets have reversed the decision they made yesterday, announcing an identical swap of Joonas Korpisalo and Markus Hannikainen for Jeff Zatkoff. Zatkoff heads back to the AHL’s Cleveland Monsters after just one day, while Korpisalo and Hannikainen re-join the Jackets. The veteran goalie Zatkoff has yet to make an NHL appearance this season, but Korpisalo hasn’t had much better luck, struggling through 12 games, including just two dismal performances in February. Blake Pietila is on his way back to the minors, as the New Jersey Devils have also changed their mind on a recent call-up, sending the young forward back to the Binghamton Devils of the AHL. Pietila played in his first two NHL games of the 2017-18 campaign on this call-up, but failed to record a point in under 20 minutes of total ice time. St. Louis Blues beat writer Lou Korac notes that the AHL lists defenseman Jordan Schmaltz and forward Tage Thompson headed to St. Louis and defenseman Chris Butler and forward Sammy Blais reassigned to the San Antonio Rampage. More likely than not, the Blues are swapping out some in-between players for others to shake up a lineup that has been ineffective of late, but there’s also a good chance that they would like to showcase all of their young pro talent ahead of the deadline. St. Louis has just three wins in their past ten games and risk missing the playoffs if their play doesn’t improve one way or another. According to Sportsnet insider Elliotte Friedman, the New York Rangers have placed Peter Holland on waivers today. Holland is no stranger to having an uncertain future; the 27-year-old has been with four different NHL organizations in the past two years and wouldn’t be surprised to join a fifth on this go-round through the waiver wire. However, the 2009 first-rounder is on pace for the fewest NHL games and points of his career this season and may not hold much value for other teams. After clearing waivers himself, newly-acquired L.A. goaltender Scott Wedgewood is heading to the AHL, per Kings beat writer Josh Cooper. Joining Wedgewood on the trip to the AHL’s Ontario Reign is forward Jonny Brodzinski, while defenseman Paul LaDue has been recalled. LaDue has played in only seven games with the Kings this season after 22 in his 2016-17 rookie campaign and again looks to be just a depth option for Los Angeles on this call-up. The Arizona Coyotes announced they have recalled prospect Laurent Dauphin from the Tucson Roadrunners of the AHL. The 22-year-old center was re-acquired by Arizona on Jan. 10 after he had been traded to the Chicago Blackhawks during the offseason. Dauphin was originally traded in June with Connor Murphy for defenseman Niklas Hjalmarsson. The prospect was then reacquired when Arizona traded forward Anthony Duclair to Chicago with Richard Panik. Dauphin had 17 goals last year for the Roadrunners and was expected to take that next step. However, he struggled with the Rockford IceHogs early on, scoring just four goals to go with 10 assists in 33 games. 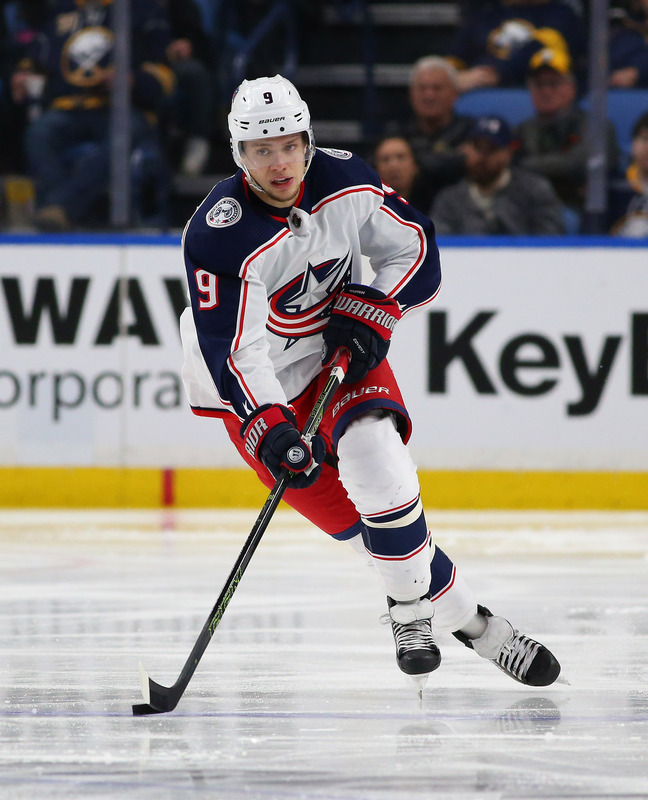 He seems to have found his game since then as he has five goals and 10 assists in just 16 games and might be ready to take on a role with Arizona now that the team moved Tobias Rieder recently to Los Angeles. The Edmonton Oilers announced they recalled winger Ty Rattie and activated Andrej Sekera from injured reserve today. The 25-year-old Rattie has 20 goals and 19 assists with the Bakersfield Condors of the AHL, but has struggled to break into the NHL over the years. He signed with Edmonton in the offseason. Sekera, who was struck in the face with a puck back on Feb. 9, has struggled this year after tearing his ACL last season. He has no goals and one assist in 18 games for Edmonton with a minus-10 rating. The team did need some defensive depth after they traded away Brandon Davidson to the New York Islanders earlier today. The Vegas Golden Knights have assigned forwards Tomas Hyka and Stefan Matteau to the Chicago Wolves of the AHL today, according to the Chicago Wolves. Hyka scored his first NHL goal Friday and had played well, but the team is likely making space for recently acquired Ryan Reaves and the impending return of James Neal to the lineup. Both were likely expected to be returned to Chicago by Monday anyway, as if the Golden Knights want them to play in the AHL playoffs, they must not be with the NHL club at the trade deadline. The Anaheim Ducks announced they have recalled forward Kalle Kossila from the San Diego Gulls of the AHL. The 24-year-old averages more than a point a game as he has 13 goals and 25 assists in 35 games for the Gulls. For the Ducks, he has one goal and one assist in 10 games. Just a few days remain before the 2018 trade deadline, but much of the hockey world were glued to their television sets this morning to watch the German Olympic team upset the Canadians. Germany had already stunned Sweden in an overtime victory to make it to the semi-final match, and are now headed to the gold medal game against the Olympic Athletes from Russia. Though that may be more exciting than minor moves around the NHL, we’ll nevertheless keep track of all the comings and goings in the league. 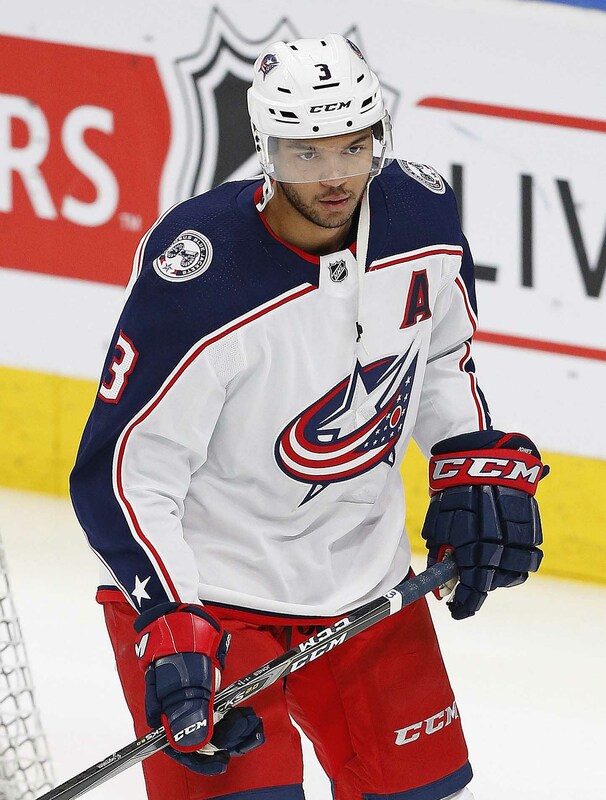 The Columbus Blue Jackets lost last night to the Philadelphia Flyers, and today made several roster moves. Joonas Korpisalo and Markus Hannikainen are both on their way to the AHL, while Jeff Zatkoff has been recalled. Korpisalo has played just three times in 2018, and the Blue Jackets won’t need a backup to start for another week. He could be recalled at that point, though Zatkoff has plenty of NHL experience as well. Lucas Wallmark is on his way back to Raleigh after the Carolina Hurricanes announced he has been recalled from the AHL’s Charlotte Checkers. The 22-year-old center has struggled to stick in the NHL for the second year in a row, suiting up for just five games with the ’Canes thus far in 2017-18 through multiple call-ups. Carolina could use the boost of Wallmark translating his high-powered AHL game to the next level.